Kendall Movers – Moving is never easy, but with Discount South Florida Movers it doesn’t have to be stressful. Our professional movers have been serving the area for many years. Your satisfaction is our highest priority as we guide you through the move. We guarantee that you will be happy with your move and you will be even happier with our rates which are the lowest around. While no two moves are the same, at Discount South Florida Movers we’ve seen it all. Whether you are moving out your home or an office building, our expert team can handle all aspects of your move. Set your mind at ease that your belongings will be transported as safely and efficiently as possible. At Discount South Florida Movers we aim to serve all of your moving needs, no matter what they are. Kendall is an unincorporated community in the interior of Miami-Dade County. Historically, the city grew more slowly than a lot of the other surrounding communities because it wasn’t open to homesteading during the Florida Land Boom on the 1920s. Even with the slow growth, it has since grown to an impressive 75,000 people. It’s also the longtime home of former attorney general Janet Reno. The Florida Metrorail has two stops in the area. Both are in Dadeland which is considered the de facto downtown area of the community. Pollo Tropical maintains their headquarters there as well. One of the most well-known attractions in is the Dadeland Mall which is located in the east. This full sized mall includes a Regal movie theater and numerous national retailers. 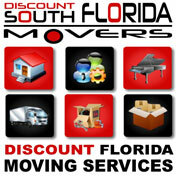 Discount South Florida and Kendall movers provide low rates on residential, commercial, piano and long distance moving.